The 5-4 Republican Supreme Court ruled that corporations have the same rights as people and gave corporations the right to spend unlimited amounts of money on campaigns enabling them to try to buy the election. The 5 Republicans on the Supreme Court voted for it, and the 4 Democrats against it. Here are just a few of the people who invested in the Republicans' promise to get rid of the inheritance tax, extend the Bush tax cuts, slash their income tax by another 20%, cut the corporate tax, and deregulate their businesses: oil baron Koch ($60 million), toxic waste trafficker Simons ($16.7 million), builder Bob Perry ($6.5 million), and Romney's wealthy friends ($52 million). Republicans try to win elections with voter I.D. laws, suppression, and intimidation. Republican governors passed voter I.D. laws despite not being able to produce any instances of voter I.D. fraud. Pennsylvania House Republican Leader said, "Voter I.D. which is going to allow Romney to win the state of Pennsylvania - done!" ﻿Many Republican states passed strict voter I.D. laws that were later struck down by the higher courts. The Supreme Court will hear Arizona's appeal next year. 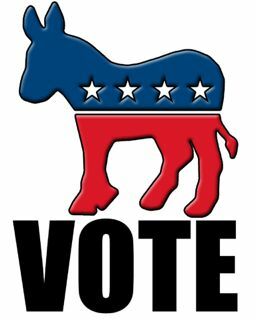 Visit I Will Vote to register to vote in your state, look up your polling locations, remind you of what ID you need to bring with you to the polls, determine which voting days are most convenient for you and your family, and more﻿. Find out who's on your ballot here. Find info about your state here.